What’s Your Favorite Hotel Perk? What’s Your Favorite Hotel Perk or Amenity? There are a handful of hotel perks that make us choose to book one hotel over the other. 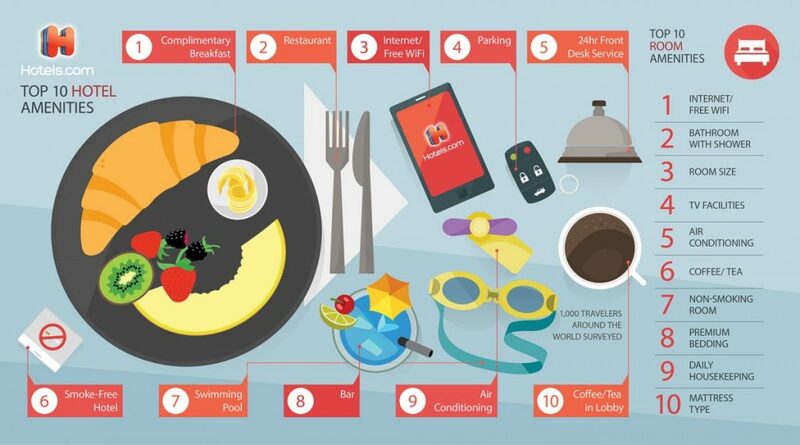 According to a Hotels.com survey, the most important hotel amenity travelers want is free breakfast. I would have to agree on this, but breakfast can also differ greatly from hotel to hotel and country to country. I would go so far as saying that breakfast at some chains in the US hardly counts as a such. A surprise to me was that a hotel restaurant was the second most important amenity. Personally it’s much more important to have free in-room internet/wifi, than being able to grab a meal at a restaurant within the hotel. For in-room amenities free wifi ranked on top. When traveling I would much rather experience a more local dining experience with the help of Yelp or Tripadvisor. Plus I’ve mostly found that I can almost always get a better dining experience and spend less by wandering off the hotel property. Much of these perks go hand-in-hand with being a member of a hotel’s loyalty program and holding elite status. I’d assume this survey did not consider elite status holders, but I would love to see a similar survey that shows what the most valuable perk of having a hotel’s elite status is. For me it would be a toss up between free breakfast and free room upgrades. Having a hotel’s elite status is a great way to get many of these perks for free, and often you can sign-up for a co-branded credit card to get automatic elite status. I’ve put together some lists of how to get free room upgrades, free breakfast, and free wifi at most hotels, so check them out if you’re looking for the best ways to get easy status. What’s your favorite hotel perk? What about a perk offered with elite status?